A fundamental feature in all the programs is the fact the software will automatically rotate images to fit into an image hole no matter in which orientation the image hole has been drawn on the template. 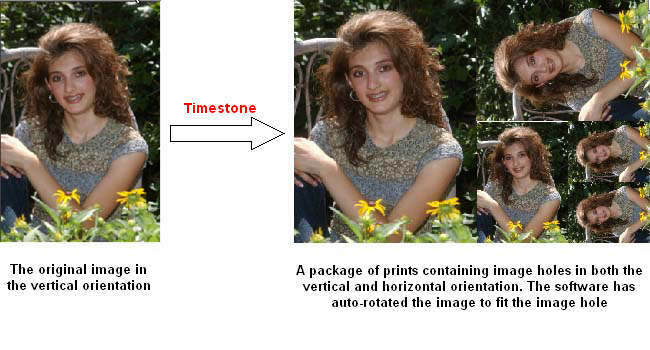 This"auto rotation" is fundamental to package printing where a layout may have image holes placed in both vertical and horizontal orientations.It also means the same templates can be used regardless of whether the images are portrait or landscape. The drawback of the above is when an image in one orientation needs tobe cropped into the other. 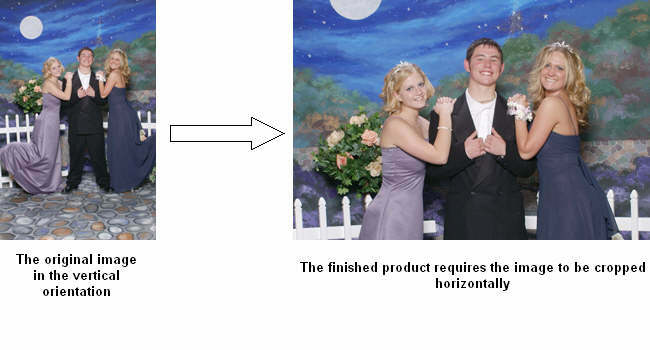 For example an 8"x10" horizontal crop is required from a vertical image as in the example below. Images in item designs (either sizable or fixed size) are never rotated. Using this knowledge create a new sizable item design template and create both a vertical and horizontal version.Select the vertical version but draw a horizontal canvas(4:5 aspect for our 8"x10" example) and fill the canvas with a horizontal image hole. Save the item design - it is now ready to be used with any pack layout in the 4:5 aspect ratio. Here are step by step instructions. In the template designer (Design Mode) start a new Sizeable Item. Locate the Different Orientation Versions button and click it to activate the vertical and horizontal orientation buttons. Select the vertical version by clicking the Vertical Version button. Draw a vertical canvas and fill the canvas with a vertical image hole. Save the item design template. This template can now be used whenever a switch in the cropping orientation is needed. If a vertical image is selected together with a layout and the item design, the software will use the vertical orientation of the item because the image is vertical. But the vertical orientation has a horizontal image hole and remembering that images in item designs are never rotated the end result is a horizontal crop.